The house was built in the 1950’s of a double layer of brick with a normal tile covered roof. It has been upgraded to use less energy by adding insulation, double glazing, solar hot water heating, efficient boiler, water butts and home composting. The house was built in the 1950’s of a double layer of brick with a normal tile covered roof. When I bought the house from the Council in 1983, it had been empty for 18 months and had originally been a Police Inspector’s house. 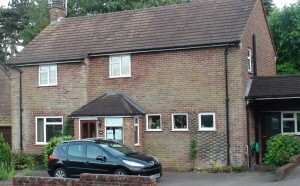 It is a link-detached house, connected to the next door house only via conjoined garages. It has 4 bedrooms and a smaller garden than the other 3 similar houses below it, as its original garden was reduced in size to allow for the building of the house next door above it. Central heating at the time of purchase consisted of an old boiler in the kitchen serving one cast iron radiator in the hall. I got permission from the Estate Agent appointed by the Council, once I had been sold the house, but not yet occupied it, to allow both a plumber and an electrician in together. Between them, they were able to update the electrical wiring, switches, and power points, and install central heating throughout, with no-one in residence. Insulation The walls had been insulated with rockwool before I bought the house. I installed loft insulation shortly after purchase, to the depth of the rafters, and remain satisfied with the effectiveness of both even now. Double Glazing Double-glazing was installed throughout in 1994, to replace original metal windows. Three panes were renewed in 2009 due to the original ones been blown and had condensation inside the panes. Solar Heating Solar panels were fitted in Aug 2008. These have provided almost non stop hot water since that time although no clear savings on gas consumption for heating is fully apparent yet. Time will tell. Heating A new Worcester Greenstar 18, wall hung, High Efficiency A rated Condensing Central Heating Gas Boiler with both heating and hot water controls has been installed in Feb 10 to increase heating efficiency and reduce fuel consumption. It complements the solar heating and so far seems to be worth its financial outlay. Gas consumption in a very cold 7 days has been 32 units. Water Rainwater is intercepted by water butts for storage for watering the garden. Composting There are facilities for composting food residue and shredded paper. The Owl Meter. There is an owl meter available for measuring electrical usage, which is still in its experimental stage in this household. The system is, however, acknowledged as an effective way of monitoring and controlling unnecessary use of electricity and therefore reducing costs. I have been told by a utilities agent that there would be no point in me transferring to their supply as I would gain no advantage from their special discounts. I am already a below average consumer of both gas and electricity through my provider – Utility Warehouse. I hope my experience will be of use to you in making any future carbon decisions.